Unimprinted white stock window badge is inexpensive and can be shipped fast. Prices range from $1.89 to $.79 each. 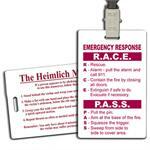 Our In-Stock Emergency Race/Pass badges are made of durable .030 vinyl and are printed in black on one side and have an oval hole. Prices range from $1.49 to .49 each. 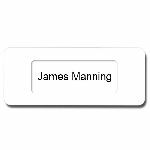 In-Stock Medical Title Badges provide instant role recognition! 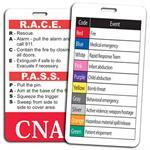 These laminated badges fit behind any badge that is 2 1/8” x 3 3/8” with an oval hole. Prices range from $1.35 to $1.05 each. Large round pre-printed polydome imprint as shown with medical titles or healthcare appropriate designs on Jumbo Healthcare Theme Plastic Badge Reel with 360° Swivel Alligator Clip. Prices range from $2.09 to $1.65. 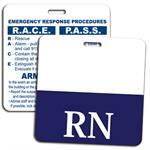 Our One-Color, Oversized Medical Title Badges emphasize your employees position and is worn behind their name tag. Use the extra space on both sides to keep important rules and policies where your staff can find them. Prices range from $0.99 to .23 each. 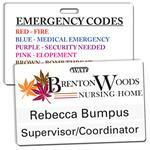 Our Full-Color, Oversized Medical Title Badges emphasize your employees position and is worn behind their name tag. Use the extra space on both sides to keep important rules and policies where your staff can find them. Prices range from $1.99 to .59 each. Laminated Vinyl Window Badge: 3" x 2 3/4"